perfectlyfree® fruit bites are a convenient, easily snackable way for kids (and everyone) to enjoy a healthy treat with benefits in a bite-size form. They are perfect for the lunchbox! BOSTON (PRWEB) MAY 07, 2018 – Staying true to its goal of providing healthier snacks to adults and kids, Incredible Foods today announced its new plant-based perfectlyfree® fruit bites are hitting the shelves of supermarkets – with broader expansion planned throughout the year. perfectlyfree® fruit bites are consistent with growing consumer recognition of the many health benefits of a plant-based diet. Shaped like grapes, perfectlyfree® fruit bites are made with real fruit puree, contain a half serving of fruit per serving (seven fruit bites) and only five grams of organic sugar per serving. A package of perfectlyfree® fruit bites contains five convenient snack pouches – each perfect for a child’s lunchbox or as an on-the-go snack. 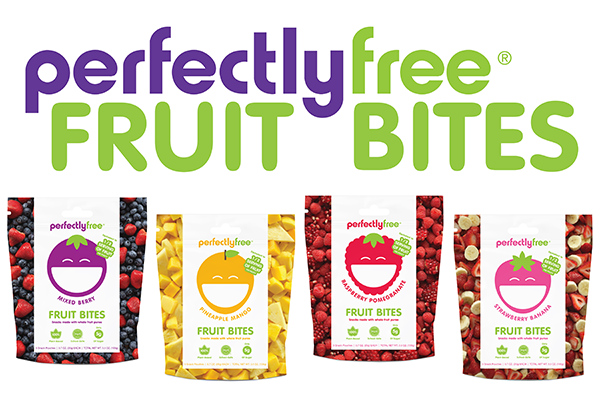 In addition, perfectlyfree® fruit bites are school-safe, since like all Incredible Foods products they’re free from the top eight food allergens – dairy, wheat, soy, eggs, fish, shellfish, peanuts, and tree nuts. perfectlyfree® fruit bites are produced in Incredible Foods’ new allergen-free manufacturing facility in Boston’s Hyde Park neighborhood. “Adopting more of a plant-based diet can bring numerous benefits, and generally make people healthy and happier,” said Kevin Murphy, CEO of Incredible Foods. “At the same time, today’s consumers are riding the wave of much healthier snacking. Kids and adults are snacking in ways that best align with their on-the-go lifestyles, with more of these consumers demanding snacks that are better for them, taste great and are fun to eat. That’s where our new plant-based perfectlyfree® fruit bites and plant-based perfectlyfree® frozen bites come in. According to market research company IRI, snacking is expecting to be a $200B industry by 2020. And the Plant Based Foods Association reports that the total market for the plant-based food sector already exceeds $5B in sales. perfectlyfree® frozen bites – treats with a creamy, non-dairy, ice-cream-like core. Wrapped in a layer of one of five delicious flavors, the family includes mint chocolate, cocoa vanilla, salted caramel vanilla, raspberry chocolate and orange crème. Each perfectlyfree® frozen bite is only 30 calories and 3 grams of sugar. perfectlyfree® non-dairy frozen dessert, a non-dairy, big 8 allergen-friendly, certified gluten-free scoopable dessert made from premium ingredients, and available in three delicious flavors: strawberry sundae, caramel café and fudge swirl. perfectlyfree® products do not contain any artificial ingredients, are certified vegan and gluten-free, as well as big eight food-allergen friendly. All perfectlyfree® snacks are produced in a dedicated free-from facility. About perfectlyfree® – The perfectlyfree® brand is committed to creating delicious plant-based foods for anyone who desires a fuller, happier, healthier, free-from lifestyle. perfectlyfree® products contain only natural, premium ingredients that are non-GMO, gluten-free and free-from the top eight food allergens: dairy, wheat, peanuts, tree nuts* (contains coconut*), eggs, soy, fish and shellfish. All products are prepared in a dedicated free-from facility. For more information, please visit perfectlyfree.com. “Like” us on Facebook and follow us on Twitter and Instagram.